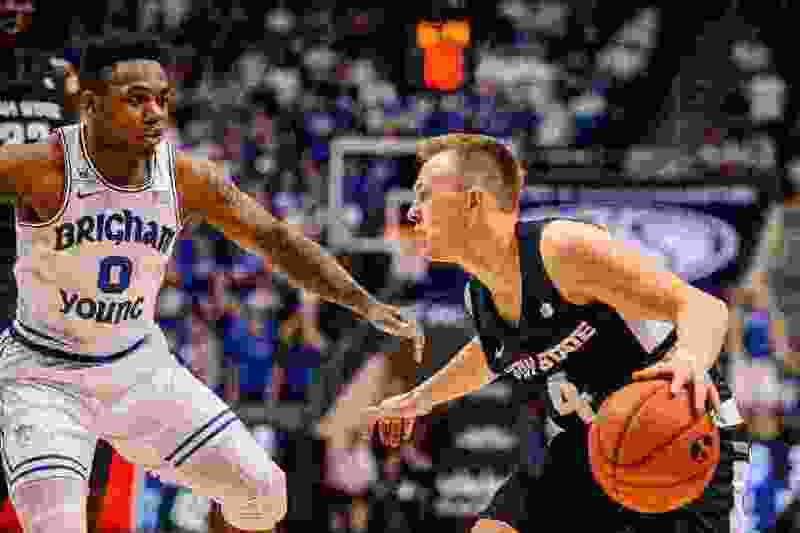 (Trent Nelson | The Salt Lake Tribune) BYU guard Jahshire Hardnett, shown here guarding Utah State guard Crew Ainge, practiced Wednesday and is available to play Thursday when the Cougars host Portland, coach Dave Rose said. Provo • Jahshire Hardnett is available to play Thursday night when BYU hosts Portland, coach Dave Rose said with a heavy amount of irritation in his voice after the disgruntled junior guard practiced with his teammates Wednesday afternoon. The Cougars (9-8, 1-1 WCC) and Pilots ( 7-9, 0-1) will meet at 7 p.m. in BYU’s first home game since an 85-66 win over Portland State on Dec. 12. Rose wanted BYU’s first home game in nearly a month to be the storyline, but a report from the website Vanquishthefoe.com on Monday night that Hardnett, the team’s third-leading scorer, had quit the team dominated the discussion and left the coach sarcastically questioning why reporters were even asking about Hardnett’s status in the first place. Told that there was a report of Hardnett’s departure, Rose asked rhetorically if it was a report from BYU, which it obviously was not. “So let’s just move on,” he said, disgustedly. Hardnett, who is averaging 10.9 points and 2.1 rebounds per game, most likely will not regain his starting spot Thursday, Rose said. Earlier in the news conference, Rose said he talks with Hardnett every week and that they have a “really good” relationship as far as understanding each other. “I know exactly what he wants, and he knows exactly what I want, and we are committed to the same thing. Looking forward to moving on,” Rose said. Team captains TJ Haws and Luke Worthington said the “challenge” — Worthington’s word — will help bring the up-and-down team together. The Cougars have lost four of their last five, including two games by more than 20 points. The Cougars didn’t show much fight against the Gaels, but Rose and the players refused to blame it on the schedule. Worthington and senior guard McKay Cannon replaced Hardnett and Zac Seljaas in the starting lineup last week, and Worthington described the team’s chemistry as “impressive.” Referring to Hardnett’s case, he said that wasn’t the first time this season a personal issue has tested the team’s unity. “The way to deal with any issue within a team is to continue to fight and play together and build on each other’s strengths,” he said. As for Portland, it has the kind of guards who have historically given BYU trouble, Rose said. Marcus Shaver Jr. and JoJo Walker combine to score more than 28 points per game. “Hopefully we can stay in front of them and find ways to keep them on the perimeter and then challenge their 3-pointers,” Rose said. About the Pilots • They have never defeated the Cougars in the Marriott Center, and have lost five straight overall and nine of their last 10 games to BYU. … G Marcus Shaver Jr. leads them in scoring with a 14.6 average, followed by G JoJo Walker at 13.6 and G/F Josh McSwiggan at 12.9. … They have good size inside with 6-foot-9 forward Tahirou and 6-10 center Hugh Hogland. … Coach Terry Porter is 28-53 in his third season at the helm. About the Cougars • They haven’t played in the Marriott Center since a 85-66 win over Portland State on Dec. 12, but are 7-1 at home this season. … Junior F Yoeli Childs is 21st in the country in scoring (21.6 ppg. ), 14th in rebounding (10.3 rpg.) and tied for third in double-doubles with 10. … Junior G TJ Haws is shooting 48.5 percent from the field, 40 percent from 3-point range and 86 percent from the free-throw line. He scored a career-high 30 points against Portland State.